156 million. This is the number of phishing emails that are sent out every single day. Promising tech support, alerting customers of unusual sign-on activity, and replicating legitimate websites, fraudsters are constantly looking for ways to steal personal information from consumers. Out of the millions contacted each day, over 88 thousand fall for the scams and become victims of theft. Read on to educate your so you know how to avoid being scammed. Simply put: phishing scams are designed to steal money by gaining personal information such as bank account and social security numbers. 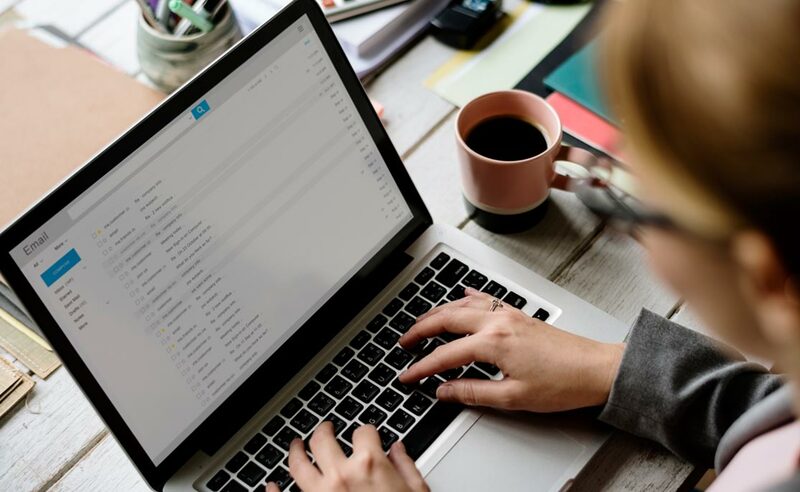 Through emails, phone calls, internet downloads, and other shady tactics, scammers work to gain your personal information along with your trust. Make no mistake. Phishers are professionals. They spend many hours perfecting their illegal crafts and attempting to make their fraudulent emails and websites as realistic looking as possible. Phishing fraud is a cybercrime, but it’s also big business. Who is Taking the Bait? So, who are these naïve targets who are falling for internet scams? You might be surprised! Contrary to popular belief, it isn’t just the elderly or otherwise vulnerable that fall for fraudulent claims. Many of today’s phishing scams are aimed at those working in human resources and financial services as well as everyday Joes using social media platforms such as Facebook or Twitter. 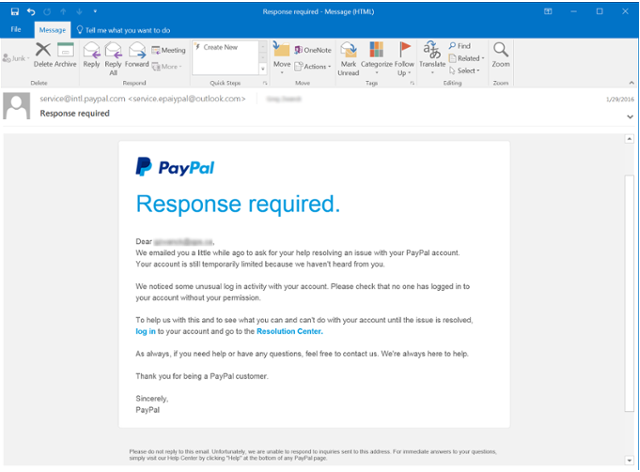 One of the most widely used (and successful) phishing scams uses the Paypal logo and a Paypal related email to alert customers that there has been suspicious activity on their account. Similar fraud campaigns claim that Paypal has suspended the user’s account until their information has been updated. The example below is provided by Phishing.org, an organization that provides education on phishing fraud and aims to keep people up to date on the latest phishing scams. Because the site that users are rerouted to when clicking the fake Paypal link has the Paypal logo and looks legitimate, many customers enter their information with no qualms and are shocked to learn later on that their accounts have been compromised. 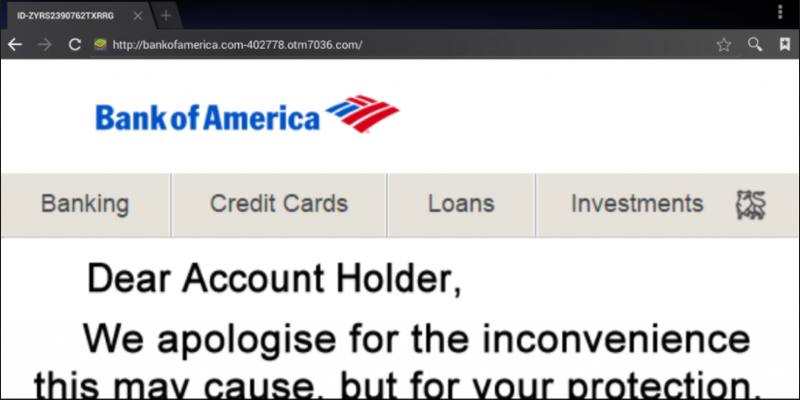 Another type of phishing scam uses spoofed credit card and bank websites. Customers receive emails prompting them to log in or provide information regarding their account. The links provided are fraudulent and reroute not to the bank website, but one controlled by the fraudsters. Because the websites are so well crafted, it is hard to tell that they aren’t real! Through these types of schemes, millions become victims of identity theft every single year. Investigations are being conducted around the country and phishing crackdowns are on the rise. Because so many of the criminals behind these crimes live outside of the U.S., it is difficult to stop all of the scams. This makes prevention an important tool in protecting one’s personal and financial information. See our blog entry specifically about privacy for ideas. Think twice before clicking, especially when the email or link is form an unknown source. Be leery of anyone asking you to give out personal information through email. Go to any company websites directly from your browser instead of clicking a link. Look for security certificates on websites and avoid filling out personal forms online. You can also check out this article by Phishing.org which outlines 10 ways to avoid phishing scams. Finally, never be afraid to have someone look into a company, business deal, or other situation that seems “to good to be true” and report them to the proper authorities.